There is an argument, made by many, that the first autocephalous Church to expand into a new territory “gets” that territory. I call it the flag-planting theory, because it reminds me of 15th century European explorers who reached the shores of undiscovered (for them) lands, stuck a flag in the sand, and claimed that piece of earth for their nation. It occurred to me that much the same argument could be made on a state-by-state basis. The United States is, after all, a “federal” country, right? (Or at least, we’re supposed to be, according to our Constitution.) Couldn’t you make the argument that while the Russian Church (and, by extension, the OCA) may have flag-planting rights in Alaska and California, the other 48 states are up for grabs? My research is far from complete; I’m presenting what amounts to partial results thus far. For some states, I’m not yet entirely certain who was the first. I would very much appreciate help from any readers who might have additions or corrections. Alaska – Russian (Kodiak, 1794). Of course. Arizona – Serbian (Globe, by at least 1916). Arkansas – Russian or Greek (Slovak, ca. 1895-1918?, or Little Rock, 1913). 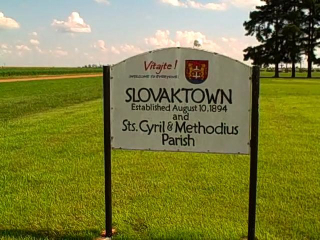 Slovak (or Slovaktown) was a town of Eastern European immigrants to Arkansas, and it was founded in 1894. I’ve heard rumors that a Russian church was founded not long after the town itself, but I can’t find it on the official Russian lists of parishes in 1906, 1911, or 1918. The last service inthe Slovak church took place in 1948. (See the update at the bottom of this article for more information.) The oldest surviving Orthodox church in Arkansas is the Greek parish in Little Rock, founded in 1913. Depending on when the Slovak parish was established, it’s possible that the Little Rock Greek church was the first in Arkansas. California – Russian (Fort Ross, 1825 or San Francisco, 1868). There was a Russian chapel at Fort Ross from 1825 to 1841. During this period, California was a part of Mexico; it wouldn’t become an American territory until 1847. The first parish in the American period was begun in San Francisco in 1868, and it still exists (after numerous name and building changes) as Holy Trinity Cathedral (OCA). Colorado – Russian (Denver & Pueblo, 1903). Both parishes joined the Russian Mission in 1903. I’m not sure when the Denver Greek cathedral was founded; it’s possible that it predates the Russian churches. Connecticut – Russian (Bridgeport, 1894). Delaware – Russian (Wilmington, ca. 1911-1913). District of Columbia – Greek (Washington, 1904). Florida – Greek (Tarpon Springs, 1907). Georgia – Greek (Savannah, 1900). Hawaii – Russian (Fort Elizabeth, 1815). That’s right, 1815. For a good history of Orthodoxy in Hawaii, check out this Orthodox Wiki article. Idaho – Greek (Pocatello, 1915). Illinois – Greek & Russian (Chicago, 1892). We’ve discussed the early Chicago parishes in earlier posts, and we’ll continue to do so in the future. Indiana – Greek (Indianapolis, 1910). Iowa – Greek & Syrian (Waterloo & Cedar Rapids, 1914). Both parishes began in 1914, and when the founding dates are in the same year, I’m calling it a tie. Kansas – Serbian (Kansas City, 1904). Of course, in 1904 the Serbian churches were technically a part of the Russian mission, but many (including Kansas City) functioned almost independently, obtaining their priests directly from Serbia and being run, for all practical purposes, by lay boards of trustees. Kentucky – Greek (Louisville, 1927). There were Greeks in Kentucky by the turn of the century, and there may have been a parish prior to 1927. Louisiana – Greek (New Orleans, 1865). Maine – Greek (Saco, 1909). Maryland – Greek (Baltimore, 1894 & 1906). A Greek parish was founded in Baltimore in 1894, but it lasted only a few months. The next Orthodox church in Maryland — also Greek, and also in Baltimore — was established in 1906. Massachusetts – Greek & Syrian (Lowell & Boston, 1900). Michigan – Russian (Detroit, 1907). Minnesota – Russian (Minneapolis, 1892). This was the parish of St. Alexis Toth. Missouri – Greek (St. Louis, 1904). Montana – Serbian (Butte, 1904). Nebraska – Syrian (Kearney, 1903). The Greek people of Ely had always traveled to McGill for church. St. Barbara’s had decided to build a fellowship hall in Ely around 1940. At the last minute the Ely people decided that they wanted to build their own parish. Hence, the beginning of St. Alexios Greek Orthodox Church in Ely, Nevada. Both churches are still in operation, though neither has a resident priest. New Hampshire – Greek (Manchester, 1905). New Jersey – Russian (Garfield, 1898). New Mexico – Greek (Albuquerque, 1944). New York – Russian (New York City, 1870). That parish was really more of an embassy chapel, and it closed in 1883. The oldest surviving parish in New York is Holy Trinity Greek Cathedral, founded in 1892. North Carolina – Greek (Asheville, 1922). One of the other Greek parishes may predate Asheville. The 1916 Census of Religious Bodies lists no Orthodox churches in the state, so the first parish would have been sometime after that. North Dakota – Russian (Wilton, ca. 1913-18). Ohio – Russian (Cleveland, 1896). Oklahoma – Russian (Hartshorne, by at least 1906). This was founded as a Uniate parish in 1897. I don’t know the precise date when it joined the Russian Mission, but it would have been close to the turn of the century. Oregon – Russian (Portland, 1895). The Russian chapel in Portland fell into disrepair, and by 1907, the Greeks founded their own church, which is the oldest surviving parish in Oregon. Pennsylvania – Russian (Wilkes-Barre, 1892). Rhode Island – Greek (Providence, 1905). South Carolina – Greek (Charleston & Spartanburg, 1911). South Dakota – Greek (Sioux Falls, ca. 1959). There might be something earlier, but as of the 1936 Census of Religious Bodies, there were still no Orthodox churches in South Dakota. Tennessee – Greek (Memphis, ca. 1915-16). The Greeks also started a parish in Nashville in 1917. Texas – Russian (Galveston, 1895). The Galveston parish, Ss. Constantine and Helen, is now under the Serbian Church. Utah – Greek (Salt Lake City, 1905). Vermont – Russian (Springfield, 1906). Virginia – Greek (Norfolk, 1911). Washington – Russian (Seattle, 1892). West Virginia – Syrian (Charleston, 1905). Wisconsin – Not sure. I know that Greek parishes in Milwaukee and Sheboygan both existed by 1911. According to the OCA website, its parish in Lublin was founded in 1908, though I’m told that the oldest parish in Wisconsin is St. John the Baptist (Russian?) in the small rural town of Huron. The official Russian Archdiocese list of parishes, published in 1911, includes none in Wisconsin. It’s possible that Lublin and/or Huron began as Uniate communities and later became Orthodox, but I can’t confirm this. In any event, by 1916, there were three Russian parishes in Wisconsin. At the moment, who got there first is unclear. Wyoming – Greek (Cheyenne, 1922). I don’t know when the Greek churches in Rock Springs and Casper were founded, and it’s possible that one of them predates Cheyenne. Regardless, I’m confident that the first Orthodox parish in Wyoming was Greek. In 1916, there were no Orthodox churches in the state. By 1936, there were two — both of them Greek. Adding it all up, that’s (roughly) 22 states for the Greeks, 18 for the Russians, 3 for the Syrians, and 3 for the Serbs, plus several states with ties (that is, multiple first parishes in the same year). Another interesting way to look at this is to divide the states into regions – say, East, Midwest, South, and West. In the East, Midwest, and West, the Greeks and Russians are basically even. In the South, the Greeks dominate, with 9 of 13 states. In fact, the Syrians and the Russians are even in the South, with two states apiece. Let me be clear: I am not arguing that one or another jurisdiction has special rights to any given state. I am simply pointing out 1) what the first parishes in each state were, and 2) which jurisdictions might theoretically have claim on which states, if the flag-planting theory were applied to states rather than the entire continent. As I said earlier, the above list is far from complete. If you have any information at all that would make the list more accurate, please comment below or email me at mfnamee [at] gmail [dot] com. UPDATE (9/1/09): Isa Almisry points out that I have the wrong date for the Chicago parishes, which were founded in 1892 (not 1894, as originally reported). I’ve corrected the entry above. Also, thanks to Stephen Smith for sending some interesting articles on the history of Slovak/Slovaktown, Arkansas. One of these articles, from the Stuttgart Daily Leader (May 16, 1980), indicates that Slovak’s first Russian church building was constructed in 1918. A Roman Catholic church (Ss. Cyril & Methodius) was founded in the town’s early years, near the turn of the century, but the Orthodox church seems to have come along later. As I originally noted, the Slovak parish does not appear on the official Russian Mission lists of 1906, 1911, or 1918. I have heard rumors that St. John Kochurov of Chicago visited Slovak; St. John returned to Russia in 1907, so obviously, such a visit must have taken place before then. But the fact that he visited doesn’t necessarily mean there was a parish; it simply means that there were Orthodox Christians present. Given the lack of evidence for a parish in Slovak prior to 1918, I’m inclined to say that the Greek church in Little Rock (founded in 1913) is the first Orthodox parish in Arkansas. St. John the Baptist Orthodox Church in rural Huron, WI is the oldest in WI. The area was settled by Russians, Ukrainians in the logging industry. Holy Assumption in Lublin, WI just celebrated their centenial last year 2008. The Wisconsin entry has been updated to include this information. I will post any further updates in this space. Keep the corrections coming in! UPDATE (2/26/10): I’ve updated the entry for Wyoming. Previously, I had said that the first church was Greek, but I wasn’t sure about the city; now, I’m pretty sure that the first one was Ss. Constantine & Helen Church in Cheyenne, founded in 1922. I also made a minor adjustment to the Wisconsin entry, indicating that there were three Russian parishes in the state by 1916. UPDATE (3/4/10): I’ve been learning a lot about the Greek parishes in McGill/Ely, Nevada, thanks to Dianna Callaway, and I’ve updated the entry for Nevada to include that new information. Next : The Ordination of the Rev. Ingram N.W. Irvine, D.D. Another important list to develop would be the history and sees of bishops in America, e.g., New York, Boston, Chicago, San Francisco, and which parishes had close, official or unknown ties with a bishop and which local church. One could get all fancy and weight the size of parishes, the number of parishes, etc. I, too, have often thought it odd that planting a flag in Alaska and SF would somehow give one jurisdiction over an entire continent. Doesn’t seem right. Also, what’s the problem with having multiple jurisdictions in a single country? The Roman Empire had 5 ‘autocephalous’ patriarchates within its political borders. Why not allow for a division of North America and the ‘diaspora’ between local churches, autocephalies and autonomies? For that matter, why don’t we just acknowledge that what we have currently are very oddly gerrymandered geographical dioceses under different jurisdictions? We don’t have one bishop, one city, but we do have one bishop per parish and usually per city or neighborhood. For instance, the OCA bishop in NYC has the east village along a swatch to the middle upper east side and over to west Harlem. I’m sure there’s a way to map it out so no one overlaps. Personally, I think the first parish there with a real, honest to goodness bishop tied to a real local Synod is responsible for the region where there was the same. This takes out of the mix all of what were essentially private chapels / social clubs. Of course, such a way of thinking presume the Church can be owned. The best idea is still some version of Met. Jonah’s suggestion (which is basically what Chambesy put in place, pace the Archons and the GOA Met. of SF): get all the local bishops of a region together to start deciding things in council and let everyone keep their ties to the Old World, for now. All these jurisdictions already make up the American Orthodox Church. I’m very optimistic about Chambesy. One of the things I like best about it is that the Old World has, in a very up-front fashion, declared the Episcopal Assembly to be temporary, and its stated purpose is to create a plan to unite the jurisdictions and end the uncanonical ecclesiastical situation. I am sure there will be bumps in the road, but this, in my view, is far more promising than any previous attempt at American Orthodox administrative unity. It’s especially notable (and unprecedented) that Chambesy is backed by both the Old World and the New World, and both Moscow and the EP. Met Jonah has also publicly declared his support and involvement in the Episcopal Assembly. Such unanimous support is certainly unprecedented. All the other attempts at unity (St. Tikhon’s 1905 plan, Ofiesh’s church, the Federated Primary Jurisdictions of the 1940s, SCOBA, and the OCA’s autocephaly) have been missing one or more of the necessary players. Chambesy has them all. yes, the development of the hierarchy and its oversight is imperative for us as Orthodox Christians: a priest only exists in stead of a bishop. Actually the Chicago date has to be pushed back, along with the appearance of a Greek bishop (although Meletios still has the distinction for staying around and organizing a hierarchy). Bishop Dionysios Lattas of Zante came for the Parliament of Religions in 1893, and consecrated the original Annunciation parish on its feastday. Ethnic Chicago: a multicultural portrait By Melvin G. Holli, Peter d’Alroy Jones p. 264 (I’ve seen him mentioned in connection elsewhere with the Parliament). btw, p. 271 reports a national meeting held in Chicago in 1924 calling on the Greek government and the CoG to take the Americas back from the EP. Since the bishop had to enter the country by some other port, and I’ve yet to see any reference to him anywhere else, I wonder what that says about the state of the Greek parished in New York (the most likely entry point), Boston etc. As for “planting a flag,” by the time that flag was planted in SF with the establishment of the cathedral, SF was an inseperable part from much of the contenent (witness the Pacific railway). If someone else had come to Canada, that would have been a different story, but the RM was first there as well. Ditto Mexico. At the NY Times report of the consecration of St. Raphael’s Cathedral (1895) notes that the bishop was going next year to Brazil (which wouldn’t automatically give a claim to all of South America, but certainly more sure that the 1922 GOA charter claiming it when the Greek flag hadn’t been planted there). But as for the present, yes things can be mapped. As for Chambesy, well….I’m not sure what the reference to the archons and the GOA SF bishop specifically refers too. Having now listened to SCOBA’s secretary take on it, refering to the “so called autocephaly of the OCA,” the “all/unanimous” mantra, that the OCA is “obviously” going to have to go along etc., it seems the papering over of the problem is with very thin paper. Comparing the statements of the PoM (“this will lead to Autocephalous Churches”) and the statements I’m seeing from the GOARCH, this is going to come to a head pretty quickly, maybe as soon as they get around to officially inviting/informing Met. Jonah. The recent petition of the UAOC to the EP to do what UOC-USA did a decade ago might force things even sooner. But that is less history that present day realities. Forgive me — 1894 for Chicago was an error. The correct date is 1892. I’ll make that correction. Abp Dionysius of Zante is a fascinating figure. He was born in 1836, spent a long time in the Holy Land, and then attended various universities in Western Europe (Strasbourg, Berlin, Leipzig, Munich). He visited England in 1869, and the next year he was present at Vatican I in Rome. He then returned to Greece, ultimately becoming Bishop of Zante (Zakynthos). When he came to America for the Parliament of Religions, he came through New York City. His visit to America is well-chronicled in the newspapers. (For a sampling, search the NY Times archives for “Dionysius” and “Zante.” Of course, the Chicago papers have the most material.) I’ve never seen any contemporary references (say, in the Chicago newspapers) to Dionysius consecrating the Chicago Greek church, though I’m not disputing that he did. After visiting Chicago, he passed through San Francisco, where he met with the Greeks there. It would be interesting to know whether he called on the Russian Bishop Nicholas. He apparently went home across the Pacific, as he visited a Methodist conference in India on his way back to Greece. In September 1894, shortly after returning to Greece, he died at the age of 58. The first services are said to be for the Syrians in Lennoxville, Quebec in the 1870’s, by priests from America. the same site says the Bp. Nikolai of the Russian Mission was the first bishop to visit Canada in the 1890’s. First bishop Alexander Nemolovsky (1916), later head of the RM. Manitoba: Russian (1897) St. Michael’s, Gardenton. Saskatchewan: Romanian (1902). St. Nicholas’, Regina (1st Romanian Orthodox in North America). Ontario: Greek (1909). St. George, Toronto. Quebec: Russian (1907). SS Peter and Paul, Montreal. As a curiosity: Bucovinian (!) (1911/1916). St. John of Suceava, Montreal. I know I’ve missed a few provinces and territories, but it’s a start. Isa, thanks for all this. I certainly didn’t mean to leave out the Canadian provinces, and I did intend to examine them as well, but I thought I’d post the States first, since I’d already done the research. Incidentally, the name of our Society (of Orthodox Christian History in the Americas) was intentionally chosen so as to include Canada, as well as the rest of the New World. We certainly don’t intend to exclude or marginalize the Canadians; although, given that my own research has tended to focus on the United States, my posts may be rather U.S.-centric. We hope, in the future, to include contributions from Canadian Orthodox historians as well. Who was the priest going up to Quebec in 1870s? On the East Coast, there was only Nicholas Bjerring, for the Russians, as far as I know. It is true we do not intend to exclude Canada, Mexico, Central America, or South America. In North Dakota, the Wilton parish was Ukrainian, but under the Russian Mission and connected to the deanery in Minneapolis. There were also Ukrainians out further west. They formed a parish around the same time but to the best of my knowledge were never affiliated with the Russian Mission or the Metropolia. I am not sure when Minot or Grand Forks got their Greek parishes. The latter is now closed, the former is now OCA but shrinking. So warns this NY Times Russophone hysteria, about the increase in the Russian archdiocese, in particular with the conversion of the uniates. It also gives some interesting stats from the time, and some nice pictures (of course, for an article like this hatchet job, there’s a full page spread). For the sake of accuracy, the Russian parish in Brookside, Alabama, was founded in 1894 rather than, as this article states, in 1906 or later. Also, I would add that I have a copy of the official 1906 list of parishes for the Russian Archdiocese, and it doesn’t include one in Alabama. The Brookside parish does appear on the official 1911 list, which is why I concluded that the parish was founded between 1906 and 1911. I wouldn’t be surprised if it was originally Uniate, but if it was Orthodox prior to 1906, I can’t imagine why it wasn’t included on the official list. I am pursuingany available documentation of the official story of the parish. Brookside was originally settled by miners from Slovakia (village of Slovinsky) and they were Uniate. The official story, however, is that many of them became Orthodox and began an Orthodox parish in 1894. The remainder eventually became Latin Rite Catholics and the Orthodox and Catholic churches were just across the street from each other. The Catholic church was sold to protestants a few years ago and there is ow no Catholic presence in the village. I also checked the lists of parishes again, and Brookside definitely does not appear on the 1906 list. My suspicion is still that the parish began as Uniate in 1894 and converted to Orthodoxy at some point between 1906 and 1911, but I can’t confirm that. I am an historian of the Brookside community and her Russian and Slovak community there. All church records show that the congregation was indeed founded in 1894 by immigrants from the Carpatho-Rusyn mountain range and Galacia. The first temple was named for St. George and that temple was destroyed by tornado. The second temple was named Protection of the Mother of God and was destroyed by fire. The third temple was erected in 1916 and named for St. Nicholas. My research shows that it was always an Orthodox parish. Thanks for this information. I wasn’t aware of the McGill church, and would love to learn more. However, I do know that there was a Greek church in Ely by at least 1911. I have a list of parishes from that year, and Ely is included. From what I have heard, that early Ely parish closed, for some reason. It’s possible that another opened later, unconnected to the first. Hmm… that is very interesting. Does your list give the name of the parish? I wonder if they attributed St. Barbara’s to Ely, as it has always been the larger town and is the county seat of White Pine. There have only been 2 church buildings of the orthodox faith in White Pine County: St. Barbara’s of McGill (1910) and St. Alexios of Ely (1940). The Archives only has 1 document on St. Barbara’s. It was written by Fr. George Sardounis who was our parish priest from 1917-1919, and he states our parish was est. in 1911 and our congregation was listed as 400. There were a lot of plans in the early 1900’s to build other parish’s, but these are the only 2 that actually came about. Thanks! Great discussion. Concerning North Carolina… When I used to live there I read a fascinating piece on a St Peter & Paul (Russian) Orthodox Church in St. Helena, NC (located off of I-40 not far from Wilmington, NC). Apparently the church is very old, and nearly abandoned now, sadly. A google search shows that it’s on the list of most threatened places in the county. The article (I think from the Wilmington, NC, paper, or the Raleigh News & Observer?) stated that a few parishioners still there listen to a recording of Divine Liturgy in church on Sunday mornings. I cannot find this parish on any listing of any diocese. Does anyone know its status? Is it OCA? ROCOR? Moscow Patriarchate, or other? Is it possible that this church could pre-date the Greek church in Asheville? Maria: I can’t find a name for the early Ely parish. I do know that the priest from (at least) 1911-1915 was Fr. Germanos Georgiou. In 1916, he became the priest of St. John the Baptist Church in Pueblo, CO. Does the history of the McGill parish, written by Fr. George Sardounis, mention Fr. Germanos Georgiou? Also, in the 1916 Census of Religious Bodies, there is only one Greek church listed in Nevada. The Census doesn’t give the city, but this does suggest that the Ely parish is identical with the McGill parish which you mentioned. Finally, would you be willing to send me a copy of Fr. George Sardounis’ history of the McGill church? I’d love to add it to my archives. My email address is mfnamee [at] gmail [dot] com. Thank you! The 1916 Census of Religious Bodies lists no Russian parishes in North Carolina. I don’t have the full 1926 Census, but the 1936 Census does list one Russian church in the state (though it doesn’t give the city). This parish is listed as “rural,” and it had 67 members (35 men, 32 women). It would have been under the jurisdiction of the Metropolia (today’s OCA). However, as you indicated, no such parish is listed on the OCA website, and I couldn’t find it in the SCOBA parish directory (which includes ROCOR). There are no Moscow Patriarchal parishes in North Carolina, either. I found a newspaper article (perhaps the same one you found), in the Wilmington Star-News, dated 3/9/1980. (To read it, visit this URL: http://tiny.cc/Ve316) The article says that the parish was founded in 1932, but lost a lot of parishioners after World War II, and was on the brink of closure in 1980. I suspect that only the building survives today. Given the founding date (1932), it looks like this parish came along a decade after the Greek church in Asheville. Still, it is worth remembering. Thank you for calling it to my attention. Wait a second — I may have found something about the St. Helena, NC parish. On the website city-data.com (http://tiny.cc/7MOHa), they list a ROCOR parish in Pender County, NC (which includes St. Helena) in 2000. This parish is not listed in ROCOR’s parish directory, so it either has closed since 2000, or, as a semi-functioning parish, is not listed in the official directory. The website historicwilmington.org had an article on the parish in 2007 (http://www.historicwilmington.org/documents/St%20Peter&Paul.pdf). This article says that there are just four (4) parishioners who meet on Sundays and listen to a recording of the Divine Liturgy. There hasn’t been a priest since 1998; it’s not clear whether that means that there hasn’t been a RESIDENT priest since then, or that there hasn’t even been a visiting priest. Anyway, this article is worth reading. Thanks Matthew for the info. That piece from historicwilmington.org was the one that I read about 2 years ago. It would be a shame to have this church simply fold — I know that the OCA has a mission parish in Wilmington, NC. Might be good if they or one of the other local Orthodox parishes could “adopt” the St Helena church and even hold services there once in a while. This is being done in Washington state in one of the oldest Orthodox churches in the lower 48 — Holy Trinity in Wilkeson, Washington, which is about 45 min from Tacoma. There is no longer any significant Orthodox presence in Wilkeson, but the local OCA parish in Tacoma, Wash., holds services in the historic Wilkeson church several times a year (including on their feast day on Pentecost). I believe that this chapel was consecrated by St. Tikhon as well and I think dates back to 1896 or so. It would be the oldest Orthodox parish in Washington state but I believe it was beat out by the Seattle parish by a couple of years. Maria, it does look like the McGill church is the same as the early Ely church. Another source (http://tiny.cc/bkRb0) says that, in 1912, there were roughly 1600 Greeks living in White Pine County (which includes both Ely and McGill). However, that year, a strike led to the decline of the mining industry in the area, and most of the Greeks left. Another church, St. Alexios, was dedicated in Ely in 1930. Gregg, in addition to the OCA mission, there is also a well-established Greek church in Wilmington, St. Nicholas. It would certainly be appropriate for these two parishes to consider “adopting” the St. Helena church. I wonder, do the Orthodox in Wilmington even know about the St. Helena church? If you have contacts in the area, I’d encourage you to let them know about it. On Nevada: just came across a contemporary source (1920) that seems (I find it ambiguous) to indicate that both McGill and Ely had a parish (in the sense of a community, not necessarily a building, though it indicates McGill had that). Neighbors: studies in immigration from the standpoint of the Episcopal church By Episcopal Church. Dept of missions and church extension. It is also interesting in that it discusses the contemporary activities of Meletios and Alexander in the US, and Met. Germanos and Bishop Aftimos. 1890 or early 1891 – Bishop Vladimir (Sokolovsky) of Alaska, the American representative of the Moscow Patriarchate, formally received a parish of Swiss Old Catholics at Dyckesville, near Fond du Lac, Wisconsin, as Western Rite parish. May 1891, Bishop Vladimir (Sokolovsky), the head of the Russian Orthodox Church in the United States, referred to the Old Catholic flock of Green Bay contacting him through their cleric Fr. Vilatte (a big name in vaganti circles) as “true ‘Old Catholic-Orthodox Christians’ [now] under the patronage of our Church,” after approving their confession of Faith and acts receiving them into Orhtodoxy, and refering their cause to the Holy Governing Synod. Spring 1892 – Bishop Nicholas (Ziorov) the new successor to Bishop Vladimir made a pastoral visit to the Dyckesville/Fond du Lac parish. Thanks, Isa. I was aware of Bishop Vladimir’s acceptance of Vilatte, and I probably should have mentioned it in the above article. This is the first I’ve heard of Bishop Nicholas visiting Vilatte’s community. I don’t doubt that he visited, but I wonder what the visit involved. On September 11, 1892, the New York Times reported that Vilatte had created his “American Catholic Church” (which, many years later, the future Fr. Raphael Morgan would briefly join). It’s just a theory, but I suspect that Bishop Nicholas visited Vilatte to figure out exactly what he was dealing with. Bishop Nicholas was a smart man and a good bishop, and he probably discerned immediately that Vilatte was not really Orthodox at all. He probably required Vilatte to be more normatively Orthodox, and Vilatte probably said he’d rather be more independent. Hence, a few months later, the creation of the American Catholic Church and the beginning of Vilatte’s full-fledged vagante career. If you find any contemporary sources for Bishop Nicholas’ visit, please let me know. I’d like to publish an article on the whole 1891-92 Vilatte/Vladimir/Nicholas connection. I wonder if the Episcopalians have any records. Grafton seems to have warned Bp. Vladimir about Vilatte. He may have had better luck with Bp. Nicholas, as the latter had it seems a cordial relationship with the Episcopalian bishops in San Francisco. What is interesting is the timing: both Bps. Vladimir and Nicholas were receiving uniates nearby who had, like Vilatte, come to see then in SF; the foundation of a Church in nearby Chicago, the enactment of the claim to jurisdiction over North (and South) America, etc. I wonder how far Dyckesville was from the road between Chicago and Minneapolis in those days. if they have anything, along with any local papers. Your instincts are spot-on. Bp Vladimir was in Chicago on April 10 (Tribune, 4/11/1891) and the next day, he was in Green Bay (Milwaukee Sentinel, 4/12/1891). According to the latter source, Bp Vladimir came from Minnesota, “where he went to visit his country men and establish a church.” This was the visit during which Bp Vladimir received the Minneapolis Uniates into Orthodoxy. So Bishop Nicholas, too, was lumping the Wisconsin Old Catholics in on his pastoral visit to the middle of the country. By September, Vilatte had gone off and created his own American Catholic Church. As you both have guessed and/or already known, the problem really was Vilatte. He simply was not stable. The interest from the Eastern and Old Catholics did help wake up the Russian Mission. The former allowed them to continue viewing missionary enterprises along Russophilic, pan-Slavic lines and the latter had the potential for some creativity. Although one should remember that it’s not ’til 1904 that New York becomes the new headquarters and North America is officially claimed, the 1890s definitely were a turning point. There may well be local papers that discuss the relationship between Vilatte and the Russian Mission. I have not looked into this. If you find something on the ground, Isa, do let us know!